The health benefits of asparagus including canned, pureed, and asparagus extract supplements are many as this slender stem packs a super antioxidant nutritional punch that may help fight cancer. Asparagus is a stem vegetable. When you eat asparagus, you are eating the stem of the asparagus plant. Asparagus is harvested and consumed before it is able to fully mature and produce fruit, more commonly known to those who grow asparagus as “going to seed.” The most common type of asparagus is the green asparagus. It is this vegetable that has made it into the 10 Healthiest Foods list. Asparagus has unique nutritional properties. Modern studies have revealed that the ancients were right in the medicinal value they placed on asparagus. There are very few calories in asparagus but lots of exceptional nutrients unique only to asparagus. The unusual properties of asparagus nutrition may actually make asparagus one of nature's most perfect foods. Asparagus is high in folic acid. In only 6 spears of asparagus there are 135 micrograms of folic acid, half of the Recommended Daily Allowance for folic acid. Asparagus is also high in potassium, calcium and Vitamin C.
Added to these health benefits of asparagus is glutathione, a phyto-chemical which is an antioxidant and has cancer-fighting properties. According to the National Cancer Institute's The Glutathione Report, asparagus is the highest tested food containing this powerful antioxidant. Asparagus has the highest amount of the valued antioxidant glutathione. Glutathione protects the body against certain types of cancer, boosts the immune system and defends against certain types of viruses. Possibly, the most important thing to know is the cancer-fighting properties of glutathione. It is quite possible the wonderful benefits of glutathione is what started the rumor that asparagus is a cancer cure. There is an internet e-mail that has been going around since October 2006 with a report supposedly from Cancer News Journal 1979 that claims asparagus is a cure for cancer. Is this fact or folklore? After several testimonies of people with cancer taking asparagus puree the article goes on to say that “what cures can also prevent.” It advises that as a cancer cure or as a preventive measure against cancer, puree asparagus and take 2-4 tablespoons of it twice a day. Before the author of this website will vouch for this supposed cancer cure, there has to be some sorting of fact from folklore. Since the origin of this article cannot be found to be verified, I must give a huge warning to all who believe that simply eating 4 tablespoons of asparagus twice a day will cure cancer. Although these claims are questionable at best, there is some truth to this article. Adding asparagus to your daily diet, either as a tasty vegetable or by pureeing and even freezing the puree in ice cube trays for convenient individual servings, cannot hurt your health. Based upon the nutritional content of asparagus and the extremely high levels of glutathione, eating asparagus puree twice a day is not a bad idea. If you want to get the maximum health benefits of asparagus in your daily diet, choose fresh or even frozen vegetabe over canned asparagus. Even canned asparagus frequently may be more nutritious than eating asparagus only once or twice a year. Think of asparagus as your glutathione supplement. This is a delicious way to add this important cancer fighting, immune-boosting, antioxidant to your daily diet. If fresh raw organic asparagus is difficult to get all year round, consider a aparagus supplement. 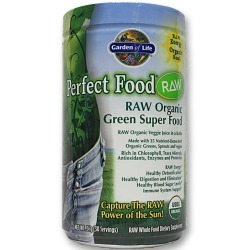 We recommend Perfect Food Raw Organic by Garden of Life - eVitamins offers it for 20% of - it uses asparagus extract with many other nutritious grasses, fruits, and vegetables.